Sometimes I have intriguing ideas for essays on comics and sometimes I have on the vaguest idea that I want to write about random comics I have read. Hence: “Contemplating Comics.” Here you will find my thoughts on the random comics I have within the past weeks. Fun! Possibly! Maybe! I finally read the first two trades of James Robinson’s Earth 2, which I had heard was good. And, well, it was. Quite good. Sometimes it was, in fact, great. I was immediately struck, actually, by how much worldbuilding had gone into it — this world was clearly not the regular Earth-Prime. It had gone through a devastating Apokolips War and, due to that, things were vastly different: Superman, Batman, and Wonder Woman were all dead and the world was policed by the “World Army,” a vaguely U.N.-type organization that still seemed kind of fascistic. 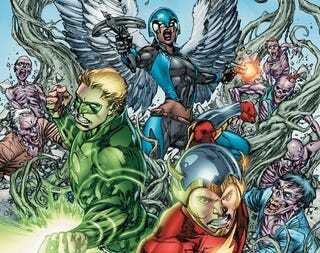 And then five years after the Apokolips War ended, new “Wonders” start to appear, including Jay Garrick as the Flash, Alan Scott as the Green Lantern, and Kendra Munoz-Saunders as Hawkgirl. These are not the same characters are the previous JSA characters. For one thing, they are all much younger — Jay, in fact, just graduated college. However, their origins have also been changed and I found that intriguing too: Jay gets his speed from the dying god Mercury, as opposed to inhaling chemicals while asleep (which was always a kind of stupid origin, now that I think about it), while Alan gets his powers from the Green (the spirit of the Earth that also empowered Swamp Thing) instead of the Starheart. This serves to tie them to the broader DC mythology. The character I found the most interesting, however, was Hawkgirl, who was the coolest, most badass character in the book. Just look at her on that cover: flying whilst shooting two guns! Unfortunately for this version of the character, those wings aren’t detachable. So I saw a few preview images of this book and I knew I had to get it. Why? Because it is one of the most insane books I have ever seen. Seriously. Have you ever played with your GI Joes and Transformers and had them fight one another in your bedroom? And, like, made up dialogue and even a rudimentary storyline? Yeah, this is that book. Actually, no, wait, this is that book except on acid. The plot is this: while the Joes are confronting their archenemy Cobra, they are interrupted by the crash landing of two Cybertronians: Bumblebee and Starscream. This is pretty much first contact with alien life and it does not go well. Later, the Decepticons go to Earth and demand Earth surrenders...and instead the GI Joes decide to invade Cybertron. Seriously, this book is completely and utterly bonkers. And yet, it is so much fun! Tom Scioli’s artwork is amazing and the writing apes a lot what made the cartoons fun, too (including a lot of rhyming on the Joe side). Also, lots of death. Seriously: lots of death, mostly mooks. Get it if you enjoy Transformers and/or GI Joe and want to see them fight. It’s awesome. ...until Professor X dies and the resulting psychic backlash lets all the personalities loose. Now David has to figure out how to survive both in the real world and inside his own head, where his other personalities are intent to take over his body. And there is one personality, especially, that looks and talks exactly like his father. Aside from giving David a thick Scottish accent, Simon Spurrier really knows a lot about each and every character in this book: from Legion to Blindfold to Chamber, each of them are written excellently and the long-running plotline is awesome, especially as David seeks to protect mutantkind proactively (as opposed to reactively, like the X-Men). The exploration of not only David’s character, but his relationship with his father and mother is outstanding. Plus, Spurrier’s Pete Wisdom is hilarious and now I want him to write Captain Britain and MI-13. I didn’t know how much I wanted this book until I read it. It was that funny. So this book is basically a sequel to Wolverine and the X-Men, except you don’t need to read that book to understand it (I didn’t). The plot is basically this: after Wolverine’s death, Spider-Man gets a posthumous note from him asking that he become a “special guidance counselor” at the Jean Grey School for a special class of students. And those students are: Rockslide (made of rocks), Sharkgirl (made of shark), Hellion (telekinesis), Eye Boy (has lots of eyes), Glob Herman (has a body made of gelatinous globs), No-Girl (a floating brain with telepathy), and Ernst (she has superstrength and also looks like an old lady). They are, of course, the Breakfast Club, only mutants. Well, not quite the Breakfast Club. More like the Breaking Things Club. In any case, Spider-Man’s job isn’t so much to teach them as to find the mole that Wolverine was sure they had in the group. But Spider-Man also knows he can teach them! He can inspire them! He can take them to a museum! Where they can get kidnapped by Sauron and Stegron! Oh wait hold on. Yes, as I said, this book is freaking hilarious. Spider-Man is hilarious. The students are hilarious. The villains are hilarious. Moreover, each of the students is given their own distinct personality and their own distinct character arc. I didn’t really know what to think of them, but at the end, I wanted to read a lot more. Especially No-Girl and Ernst. And Glob. And Sharkgirl. The series ended because of Secret Wars, so I’m hoping that it comes back in some form after Secret Wars ends. I know Peter Parker is now an international businessman, so perhaps they can play around with it. Perhaps Peter asks Miles Morales to join the class? Oh, that would be fun. That would be so much fun.